I&#39;m A Multi-Texture Style Icon! I'm A Multi-Texture Style Icon! Check out my interview over at Black Girl Long Hair! I'm honored to be featured among so many other curly beauties. If you haven't already, be sure to like their Facebook page! I found your blog through the BGLH blog <3 Really glad I did. I am loving your hair.! Hi!! 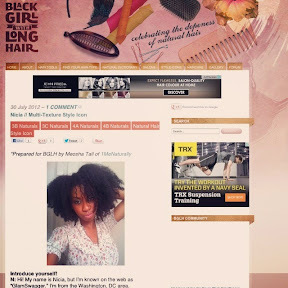 My friend was on blackgirllonghair.com and saw your picture. She sent it to me and asked, "doesn't she look like you??" I thought wow it looks alot like me. So I wanted to respect your right and privacy to post it up. I wanted to know if I could feature your picture as a look alike on my blog? you can email me at ncephas@gmail.com. Thanks!